The English-Macedonian Limnological Dictionary is a result of Slave Nikolovski-Katin, long-standing translation work, realized first of all at the Hydrobiological Institute in Ohrid. I is prepared with the aim of filling a gap in the field of biotechnical terminology and to be an aid to the students, and scientific workers who use English in this field and other natural and biotechnical sciences. In addition, the dictionary might be useful in many Macedonian and other homes as a reminder, handbook and linguistic aid. 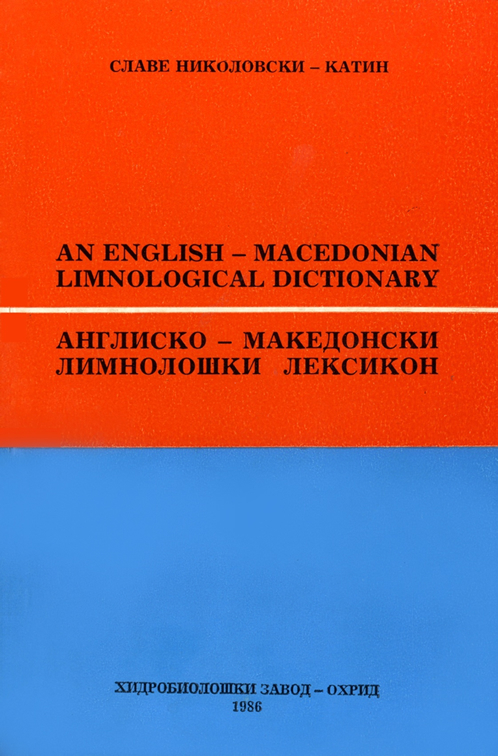 The English-Macedonian Limnological Dictionary by Slave Nikolovski-Katin, is a great contribution to the scientific work of the Hidrobiological Institute. During its preparation, the author used the latest dictionaries, encyclopaedies, lexicons, glossaries, scientific publications and other literature and aid in English, Russian, French, German, Bulgarian, Serbo-Croatian and Macedonian.